A shortcut to the program is available. 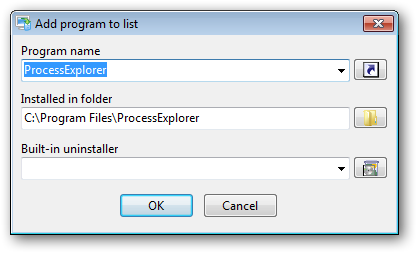 Drag and drop the program shortcut in the Installed programs list. A shortcut to the program is NOT available. Enter the known information in the dialog. Minimum required information is the program name. The program name should be entered as exactly as possible. The install location is optional, however, is recommended to be provided if is known. 2. Total Uninstall analyzes the program. Play with different analysis levels. 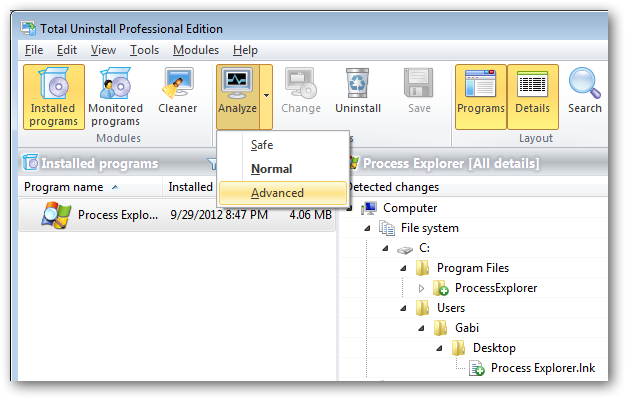 Total Uninstall will analyze the program automatically using the default analysis profile. Verify the log with detected changes. Select a different analysis level and verify the detected changes. Choose the best analysis level. Press the Uninstall button to begin the uninstall process.